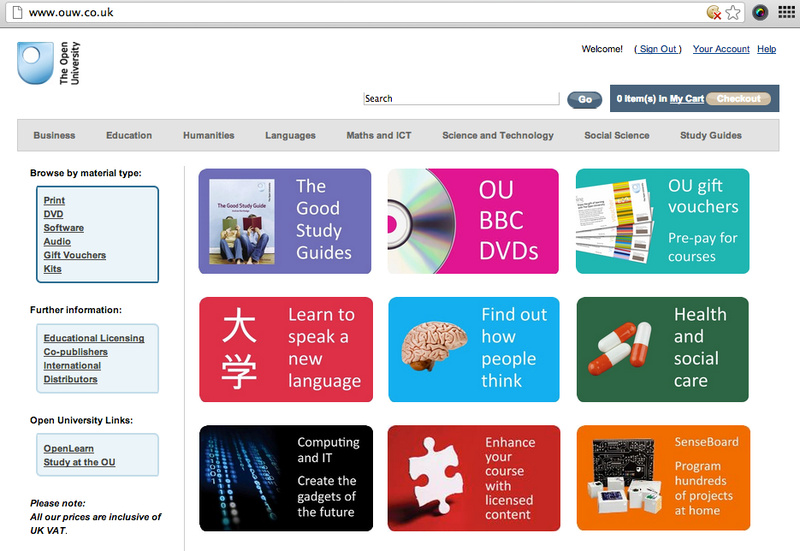 These range from the sorts of app you might expect – the StudyAtOU app, for example, which gives a rather more browser-centric way of browsing the OU’s course offerings compared to the PDF re-presenting OU Prospectus app, or the OU News app – as well as a range of “feature” apps: PhotoFit Me, a photofit testing game, or Devolve Me, another photo based app that takes you back through your evolutionary history. In a family learning context, the Our Story app “enables young children to take part in fun games which can help develop interests and skills that will be relevant to them when they start to read” (or so the blurb says…), and the Chinese Characters First Steps app draws on the OU’s Beginner’s Chinese module to provide a simple trainer around common Chinese characters. Also last week, an Open University press release announced “Another innovation milestone: The Open University launches iBooks textbooks for iPad”. I thought this had happened some time ago, with the Moon Rocks iBook (First Open University iBook now in Store, 27th March 2012), but I guess this relates the first offering of a new collection?! The titles so far appear to concentrate on science topics. The OU has a long history in producing high quality interactives/educational software (and what used to be called “computer based learning” applications) across a wide range of subject areas using licensed, as well as in-house created, content, so it’ll be interesting to see if any iBooks appear in the art history or classics area, for example. This sells OU/BBC co-pro DVDs (at a higher price than on the main Amazon website, I notice?) as well as a range of other products, including software, print materials/study guides and home experiment kits (including the Arduino like Senseboard, due out early next year). I’m not sure if the way Apple locks down iContent means that the iBooks won’t be available on the Amazon powered OUW webstore? I suspect that the sale of books required for OU courses is not an option (because of other bookseller agreements, it wasn’t when I asked years ago when I was tinkering with the now completely broken course booksearch (the backend server has been taken down)…which in passing reminds me of what I think was the only entry to the JISC MOSAIC competition that didn’t receive a prize/honourable mention: books around courses.) As far as second-hand books go, there’s always the “unofficial” OU second-hand bookstore University Book Search. Again, are there any other UK HEIs running Amazon webstores? I see from the Amazon “seller showcase” that the Ashmolean shop is at least one? The mainstay of OUW operations is (I think) licensing of OU warez, course materials and courses to local partners. A recent job ad for a Business Development Manager (International Education Agents) suggests that there may be an international push coming on this front? Open University Worldwide Ltd, which is part of the OU’s Business Development Unit, is looking to recruit a Business Development Manager (International Educational Agents). This post will be involved in supporting the OU to expand its international business through relationships with local agents or partners delivering OU qualifications to individual students and corporates in strategic markets. You will develop and implement The Open University’s new business development strategy for global partnerships, specifically focussing on the recruitment, management and growth of a network of agents to take OU products and services to B2C and B2B markets internationally. You will also work with external stakeholders in key international markets to secure relevant, accurate and timely market information. To identify, develop and close business opportunities to meet agreed financial targets.